Okay, here's the deal. `What about Bob?' is funny, but it's not the uproarious comedy that I remember from my youth. 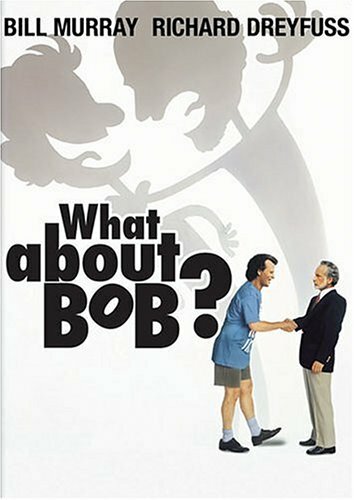 Yes, `What about Bob?' doesn't age as well as I would have liked it to. A lot of the jokes hit, but the overall feel of the film is no where near as fresh as I remember. I think I'm growing tired of comedies that push the boundaries of common sense. Why can't all comedies be smart? I mean, to have everyone around Bob be completely oblivious to his overwhelming annoyance except his doctor is just kind of pushing it for me. I mean, couldn't they have made Bob a pest to `everyone'? It would have still been funny and it would have also been believable. `What about Bob?' tells us the story of mentally disturbed Bob Wiley who becomes obsessed with his new therapist Dr. Leo Marvin; so much so that he tracks him down while he is away on vacation and imposes on him and his family, spending every waking (and some non-waking) moment with him. Leo seems to be going crazy since no one else seems to notice how incredibly intrusive Bob is being and soon Leo's entire family is making him out to be the bad guy. Bill Murray is extremely effective as Bob. He is annoying, even to the viewer. It was a perfect role for him. I tend to prefer my Richard Dreyfuss serious (take `Mr. Holland's Opus' for instance) but his comedic timing here is fine (although his beard really got on my nerves for some reason). Julie Hagerty is dreadfully annoying (maybe even more so than Bob) as Fay, Leo's wife. Charlie Korsmo (from `Hook') and Kathryn Erbe (from `Law and Order: C.I.') are believable and effective as the two Marvin children Sigmund and Anna. This movie is all about Bob though, and Bill Murray carries it steady on his shoulders. Without Murray this film would have fallen flat, but he never allows it to. Even when its ridiculousness has reached new lows of improbability it still manages to be entertaining because Murray is so committed. This is a much better movie than I was expecting. When someone explained the premise to me, I thought there was a potential to be good, with way too much room to go bad instead. I like Bill Murray to an extent. He has done some great flicks, like Caddyshack and Groundhog's Day. But he can go overboard sometimes like he did in Stripes. Richard Dreyfuss is a great actor, and I have not seen much from him that didn't impress me. But this plot of a psychiatrist (Dreyfuss) going on a vacation and having his new neurotic patient (Murray) follow him...the shrink is scared, angry and trying to get rid of the nut...but everyone including the shrink's family just loves the nut case...this is a premise that could have easily tanked and should have easily just nose-dived into stupidity and worthlessness. BUT I GOTTA GIVE THESE GUYS CREDIT!!! Somehow, they made it work!!! The cast blend so easily and well together. Dreyfuss and Murray both give spectacular performances and really work off each other very well! They script is exceptional, given the plot they had to work with. They made it funny, without being awkward or stupid. They actually pulled off this incredibly inplausable idea...and made it plausable!!! (at least by comedy standards) At least during the 90 minutes or so that you're watching this movie, you can be drawn into believing this neurotic mess and lovable guy Murray is winning the affections of everyone around him, even as the refined shrink Dreyfuss is slowly driven mad to the point of contemplating murder! The adept and brilliant comedic script and strong, wonderful acting by the entire cast make this a delightfully funny and fun viewing experience. I'll admit that when people first recommended this to me, I was skeptical. I didn't think this movie would work. But I'm not a skeptic anymore. Congratulations to everyone who made this movie so funny and pleasant to watch. And for anyone who took the trouble to enjoy this flick...you've already had your reward. Recommended! Of course the movie deserves 4 stars, however I wish I could say the same for the DVD. What does it take for DVD company to release each DVD enhanced for 16x9 TVs? Nothing! Out of 600+ Dvds, 42 are NOT enhanced for 16x9 TVs and they really look horrible when I played them on my PC. Anyway, according to my inventory. THE FOLLOWING MOVIES / COMPANY HAVE FAILED TO PRODUCE ANAMORPHIC OR 16X9 WIDESCREEN and I hope that these company will release them in the near future so that we can enjoy them on our TVs. PS: PLEASE ARTISAN, INSTEAD OF RELEASING 'BASIC INSTINCT' FOR THE 4TH TIME, WHICH MOST HAVE ALMOST THE SAME SPECIFICATIONS, CONSIDER RELEASING SOME MORE INTERESTING MOVIES WITH PROPER ATTENTION SUCH AS THOSE MENTIONED ABOVE. NOTE THAT WARNER STUDIO IS RELEASING ONE OF THE BEST 2-DISC SPECIAL EDITION SUCH AS 'SHAWSHANK REDEMPTION', 'HEAT', 'MALCOLM X', 'DOG DAY AFTERNOON', 'ALL THE PRESIDENT'S MEN' AND MANY MANY MORE. The reason why they don't release every DVD in widescreen enhanced for 16x9 is beyond me since soon Widescreen Tvs will replace standard ones. IT IS A RELIEF THAT AMAZON IS NOW STATING WHETHER THE DVD IS ANAMORPHIC OR LETTERBOXED. Son: Why'd you have to kick Bob out? Bob: (standing outside) Is this some kind of radical new therapy? Dad: YOU SEE (angrily swinging arm)!!! "What About Bob?" is the story of a man, Bob Wiley, and his new therapist, Dr. Leo Marvin. Bob, in short, can only be described as a multi-phobic personality who experiences separation anxiety after he takes an immediate liking to his new therapist, Dr. Marvin. When Bob learns that Dr. Marvin is to go on vacation for a month, he panics and lies his way into getting the number and address of Dr. Marvin's summer home. Bob follows Dr. Marvin to New Hampshire and quickly integrates himself within Dr. Marvin's family system. While Bob sees nothing wrong with his actions, he is steadily driving Dr. Marvin to his patience's edge. Bob's constant need for attention and the need to be around Dr. Marvin cause friction between the two characters. While Bob simply wants to be "cured" of his "problems," Dr. Marvin simply wants to be rid of Bob, and takes drastic action to do so. The conflict resolves itself with Bob finding insight and finally ridding himself of his phobias and obsessions, and in the process causing Dr. Marvin's nervous breakdown. After watching the movie, I diagnosed Bob Wiley with Agoraphobia without a history of Panic Disorder. He states that he has anxiety whenever he leaves his house because he is afraid of finding himself in a situation in which he might not be able to find escape or help. He fears that his "heart may stop beating, he may not be able to find a bathroom, or his bladder may explode." In order to reduce this state of anxiety he tries to avoid leaving his home (i.e., he works at home), and when he does leave he is extremely distressed, (i.e., becomes highly distraught when he has to board a bus, or get on an elevator). He becomes dizzy, nauseated, breaks into sweats, has difficulty breathing and swallowing, among other symptoms. Nor can his symptoms or anxiety be better accounted for by a different disorder, such as Social Phobia, OCD, or Panic Disorder. Two alternative diagnoses that I considered for Bob were Generalized Anxiety Disorder (GAD) and Specific Phobia because there is some overlap between the symptoms. Bob has excessive anxiety, which he cannot control, which he has experienced for a longer period than six months. His anxiety also manifests itself in his physical symptoms of trembling, nausea, sweats, dizziness, and blisters. But he does not have the specific symptoms of irritability, trouble sleeping, muscle tension, fatigue, restlessness, and difficulty concentrating that are also required in order to diagnose GAD. I also considered diagnosing Bob with Specific Phobia, namely Mysophobia. Bob realizes that his phobia of germs and diseases is unreasonable, but he cannot control the anxiety it causes him. As a result, he avoids leaving his home, or is overly cautious when he does (i.e., touches everything with napkins, disinfects payphone). But Bob does not have panic attacks caused by his phobia, which is a criterion of the disorder. And agoraphobia is better able to explain his other symptoms, which are not caused by his phobia of germs and diseases. While it was apparent what Bob's possible disorder might be, the etiologies were not as easy to understand, since they were not discussed in the movie. One model to be considered is the Psychodynamic Perspective. According to this viewpoint, phobias are "expressions of wishes, fears and fantasies that are unacceptable to the patient" (Sue et al., 2006, pg. 147). The unconscious wish or desire is shifted from the internal source to an external object or situation, producing a phobia, which becomes less threatening to the individual than the underlying impulse (Sue et al., 2006, pg. 147). According to this model people develop agoraphobia fear because they fear that they may act out unacceptable sexual desires. This fear can be lessened by the presence of a friend or spouse because it provides some protection against the agoraphobic impulses (Sue et al., 2006, pg. 147). I feel that this is a good model to work with because it provides a plausible explanation for the cause of Bob's disorder. He states in his clinical interview that he divorced his wife because "she loved Neil Diamond," but he does not state whether or not his phobia developed before or after his divorce. Bob's dislike of Neil Diamond might hint at problems within his marriage that he did not discuss, or of which he may have been only unconsciously aware. Either these problems, or these problems coupled with the shock of the divorce may have caused the onset of the disorder. It is most likely that Bob developed this phobia after his divorce, because in talking about it he did not discuss his phobia, leading me to assume that it was not the cause of his divorce. Another model to consider is the Cognitive-Behavioral Perspective. This model also helps understand Bob's agoraphobia. This model is based on the cognitive distortions and catastrophic thoughts that the individual has. These distortions and thoughts result in the development of a phobia (Sue et al., 2006, pg. 149). According to this viewpoint, Bob's agoraphobia developed because of his cognitive distortions. He is too afraid to leave his house because he has unrealistic and catastrophic thoughts (i.e. his heart will stop beating, he won't be able to find a bathroom and his bladder will explode). These thoughts make him feel more secure in his own house than they do outside of the safety of the space he has created for himself. The distorted cognitions may be the reason for Bob's phobia, and his feelings of anxiety at the thought of leaving his home. And in deciding to avoid leaving his house, Bob conditions himself to be relieved of his anxiety only in the safety of his own home, not outside it. Though Dr. Marvin did not pinpoint any etiologies for Bob's disorder, he did recommend some treatments, but not in detail. The first treatment he recommended was called "baby steps" which is a form of Behavioral Therapy. It can be likened to exposure therapy in that the patient is introduced to encounters with the feared situation, though it may not necessarily be in increasing difficulty (pg. 151). Dr. Marvin had Bob avoid thinking about a problem that he did not have to deal with directly at that moment, increasing Bob's chances for finding himself in a feared situation and overcoming whatever obstacle it presented. Dr. Marvin has Bob take baby steps, thinking only about the problem at hand (i.e., baby steps out of the office, baby steps down the hall, baby steps into the elevator). This way, Bob is able to slowly, but surely, make his way through feared situations. This is extremely helpful for Bob, because while it does cause Bob distress, it does not paralyze him. Before the therapy, Bob would think about the situation as a whole, and now he thinks about it in parts, decreasing the amount of anxiety he feels in it. Another treatment that Dr. Marvin tried was a sort of cognitive therapy. He had Bob "take a vacation from [his] problems." In this therapy, Dr. Marvin had Bob not worry about his problems. Every time a problem presented itself, Bob was supposed to take "a vacation from it." He was advised not to think about his problems and not to worry about them. In order to not worry about them, Bob would have to inevitably change the way he viewed them, cueing a change in his cognitions. These treatments were effective in helping Bob over come his phobia, though the time span given them was unrealistic. The treatments seemed to work almost immediately in helping Bob with his disorder, which is not feasible. The first treatment helped Bob confront the feared situations with greater ease and frequency, while the second helped him over come his disorder. By "taking a vacation from his problems" Bob was able to try things that had originally frightened him (i.e. sailing, diving, riding buses, touching things without napkins), and overcome his fears. This was essential to his overall recovery from Agoraphobia. Given the proper amount of time, which was not properly depicted in the movie, these therapies do have positive results. Exposure therapy has been effective in treating individuals with agoraphobia, and also specific phobias such as speech anxiety, claustrophobia, and the fear of heights. It was used to treat a man who had a fear of elevators; his phobia disappeared after only one session. Cognitive strategies, such as systematic desensitization and modeling therapy, have proven successful in treating phobias. Specifically, systematic desensitization was used to treat a man with a fear of urinating in restrooms. He was exposed to increasingly stressful situations and was able to recover from his disorder. Dr. Marvin was the only person in the movie, aside from Bob, who recognized that Bob had a disorder. Dr. Marvin realized that Bob had a phobia and an anxiety disorder. Dr. Marvin's family viewed Bob's symptomatic personality as laid back and fun loving. When Dr. Marvin checked Bob into a mental health institution, no one in the institution diagnosed Bob with a disorder; this is strange because the symptoms of Bob's disorder were very accurate. The staff should have recognized that he had a disorder. He had the entire criterion required to diagnose Agoraphobia. The treatments though were not accurate. First, the amount of time it took Bob to go through his therapy and extinguish his phobia was unrealistic. In actuality, the treatment of agoraphobia takes longer than a few days. Also, the treatments themselves were not very realistic. They had some basis in cognitive and behavioral treatments, but I do not think that they would be very successful. It would be extremely difficult to have a patient take a "vacation" from his or her phobia. The idea of taking "baby steps" would only be successful if it was more like exposure therapy, with each situation being more difficult to handle than the one before. Taking "baby steps" into an extremely distressing situation would not be possible for a patient no matter how many "baby steps" he or she took to get there. Over all I think that the film represented Agoraphobia very accurately; Bob portrayed the disorder quite well. I think though that the treatments would not be very effective, but they were creative. I also think that Dr. Marvin could have discussed the etiologies in more depth, though he did briefly touch upon them during his initial interview with Bob. There is no change that I would make to Bob, however I would change the timeline and progression of the disorder. Bob recovered far too quickly. I would recommend What About Bob?, because it is hilarious, and because it is therapeutic. However one must have an ironic sense of humor to enjoy the film to it's fullest. In What About Bob? I liked the acting as well as the plot. There was a sense of connection with the characters due to the proximate ranges which were intimate or personal. This caused me to relate to them and feel for them, which is what Frank Oz must have wanted the audience to feel. Watching, What About Bob?, so many times I have nearly memorized the script. I personally enjoy the film so much that I had already tried to break it apart into what I felt were the basic elements of all movies: plot, acting quality, and scene build up. Watching the movie after taking Film and/as Literature, I began notice the symbolism of the film in the photography, mise en scene, and the movement. To me this film was so funny that I was laughing almost the entire time, every time I watched it. I seem to enjoy the switch between paranoia from Bob to Dr. Marvin. I just can't get enough of the strangeness in the characters. It was therapeutic in the fact that it was all about therapy, and laughter is the best cure for anything, or so they say. However if you don't have an ironic sense of humor I would not recommend this film as highly to you. It would take away from the end result and the final opinion. Watch this movie at least 3 times. What about parents who let a strange man spend the night in their son's bedroom? I know some people will say I'm nitpicking, but I couldn't get it out of my head how the parents let a STRANGE MAN spend the night in their ten year-old son's room. After that scene, everything seemed even more unbelievable. And by the time the climax happened, (Too outrageous-I.M.H.O.) I just wanted it to end. I am a Bill Murray fan, but didn't like this movie very much. I bought it cheap so it's no big deal, but in hindsight I should have just rented it. And I think Richard Dreyfuss is under rated in this. I find him funnier than Bill Murray in this film. His sarcastic comments are wickedly funny. I don't blame him for being annoyed with Murray, who has some good lines but his character is just TOO weird for me to laugh at. Mmm Mmm Mmm Mmm Mmmmm FUNNY!!!!!! "Is this some new form of therapy?" What about Bob from the beginning to the end is one funny scene after another. I say funny in the sense that it's hilarious to watch, but it would be far from funny if I was Dreyfuss' character. Bill Murray once again shows why he is one of the greatest comedic actors in cinematic history. Richard Dreyfuss plays the serious lead and does so to perfection. It's so easy to dislike him in the movie and love Murray, but like I said if I was in Dreyfuss's shoes I would have gone crazy long before he did. The supporting actors are great, and I loved the old couple who were always the thorn in Dreyfuss's side. The movie is directed by Frank OZ, yes, the frank oz, and he shows his vision as a comedic director is nothing to laugh at.